“Have you ever written about coffee?” Sarah asked me one morning. I haven’t written about coffee, actually, at least not in a direct way. I’m not an avid coffee drinker. I have a cup about once a month or so, and it’s usually in the afternoon. I simply don’t drink it as part of my morning routine, though a coffee shop visit used to be a part of that routine years ago. Her preferred coffee bean of the moment is Cafe Hope dark roast whole bean coffee, given to her as a gift this Christmas. 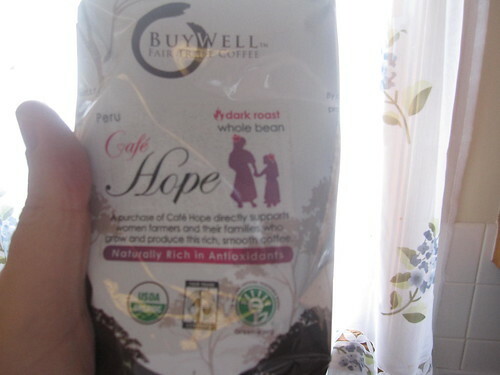 It is very similar to the Ruta Maya whole bean coffee sold at Costco, of which you can get 4.4 lbs. of for $37. Such an amount will make a huge amount of coffee. She typically does not buy that much at once. In fact, her most common source of coffee beans is gifts. Many of her friends know that she likes beans and thus it makes a convenient gift for her. What about a grinder? Don’t you need some sort of fancy equipment for that? 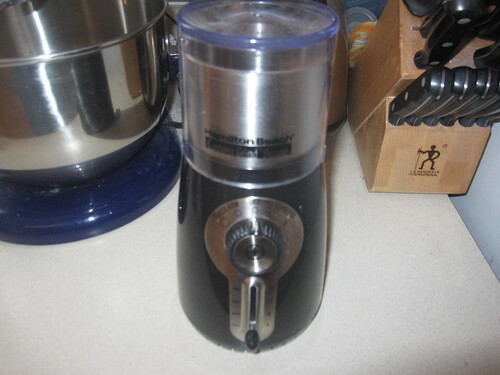 Sarah has been using this Hamilton-Beach grinder (very similar to this one for sale at Amazon for less than $30) for years now with no problems whatsoever. She simply grinds the amount on the line for two cups and adds it to her drip coffee pot to start the process in the morning. She originally received this grinder as a gift as well. It’s very similar to this one, on sale at Amazon for less than $20. “The key isn’t in having an expensive pot. 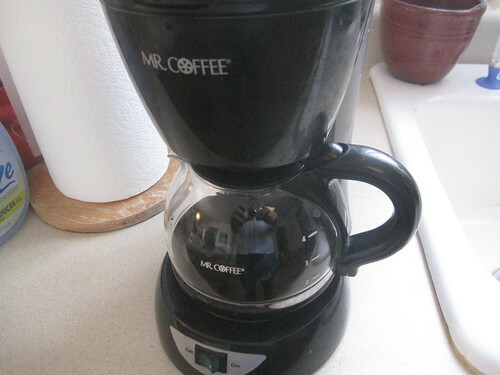 I’ve tried very expensive coffee makers and haven’t been able to tell much difference,” she says. Instead, “the key comes from using water that’s just shy of boiling.” Do not add boiling water to the pot. Instead, bring it to a boil, wait for just enough time for it to just stop boiling, then add that to your coffee maker. For the most part, Sarah simply adds milk to coffee, along with various flavorings if she happens to have any on hand. She’ll occasionally purchase creamers at the store, but usually only if they’re on sale. Her most common coffee additive, truthfully, seems to be sugar and just a small squirt of a generic hazelnut flavoring she picked up a long time ago in Amana, IA. She’s been using it for more than a year almost every morning and it’s still not run out. The bottle cost her $7. “The key is just to find something simple that you like so you can assemble it quick,” she says. I hope that some of you morning coffee drinkers find some ideas here and perhaps break that $5 a day Starbucks habit.